Boston Red Sox utility Brock Holt made history on Monday. 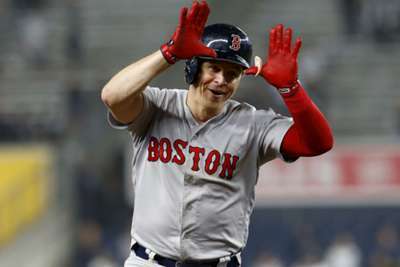 The 30-year-old hit for the cycle in the Red Sox's 16-1 road win over the New York Yankees in game three of the American League Division Series (ALDS). He is the first player ever to record a cycle in the playoffs. Holt grounded out in his first at-bat but followed with a single in the fourth inning. He then added a triple in the same frame after Boston batted around and tallied a ground rule double in the eighth. Holt completed the cycle with a solo home run off Yankees catcher Austin Romine, who was on the mound for the final inning, in the ninth. Holt finished the game four for six at the plate with five RBIs and three runs scored. The seven-year veteran finished the regular season with a .277/.362/.411 slash line. He also hit seven home runs and tallied 46 RBIs.